This month for Science Club we tackled electricity. Everyone was a bit nervous about what activity to bring. They said things like, "I don't understand electricity myself." "I'm afraid I won't be able to explain it well." and "I need to ask my husband for ideas." After much hard work and research, we came up with some exciting activities. And we all, even the adults, learned more about electricity through this challenge. First, here's a link to the basic format for Science Club. It explains how we generally plan and run things. Described below are the activities families brought for our electricity theme. One family brought a homopolar motor. It's where a piece of copper metal moves because of the opposite charges between the electricity moving through the wire and the neodymium magnet. Watch this youtube video to see it in action. It's mesmerizing. Here's an electrostatic demonstration where static electricity from the television moves the pop tab between the pop cans, making a clinking noise. The kids try to figure out how it starts and stops by grounding a wire and turning the television on and off. Here's a youtube video that shows it in action with a good written description as well. Here, a family brought a Potato Clock Kit to show how a potato or lemon can power a clock. It's a great introduction to how batteries work. Here's an activity where kids learn about conductors and insulators. There is a circuit with a light bulb in one box. The kids take items from the other box and use alligator clips to clip them to the circuit. If the bulb lights, they have a conductor. If it doesn't, they have an insulator. This is a battery testing station. Many kids have used a battery tester before, but they enjoyed the challenge of sorting. We also discussed the positive and negative sides of a battery. Inside the binder is a diagram and explanation of how batteries work. For this flashlight activity, kids could investigate the flashlight that is taken apart and see if they could get the bulb to light. We talked about completing the circuit and how the switch works. The wires and battery are taped and rubber banded to keep everything except the bulb together. Next, there was a magnetism activity, which I only got a worthless blurry picture for. Kids could determine which items were magnetic, and they learned how magnets work. 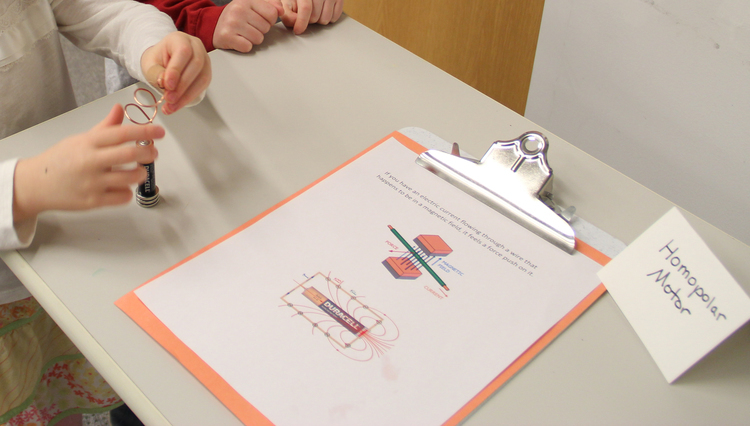 Magnetism & electricity go hand-in-hand with electromagnetism and motors, so this was a great foundational activity. After everyone made their rounds with the electricity activities, I sat down with each family individually to let them try our Snap Circuits set. I didn't have them follow a set of directions. I just asked the kids what they wanted to power (a fan, a light, or a buzzer) and then how they wanted to power it (a rechargeable battery or a hand crank). After walking them through creating their circuit, I asked if they'd like to add a switch. So, it was kind of basic, but all the kids got a chance to make a circuit work.